Testimonials... Below are some genuine spontaneous letters received from satisfied customers. The most recent are at the top. I deliberately do not give their full names or address unless authorised. 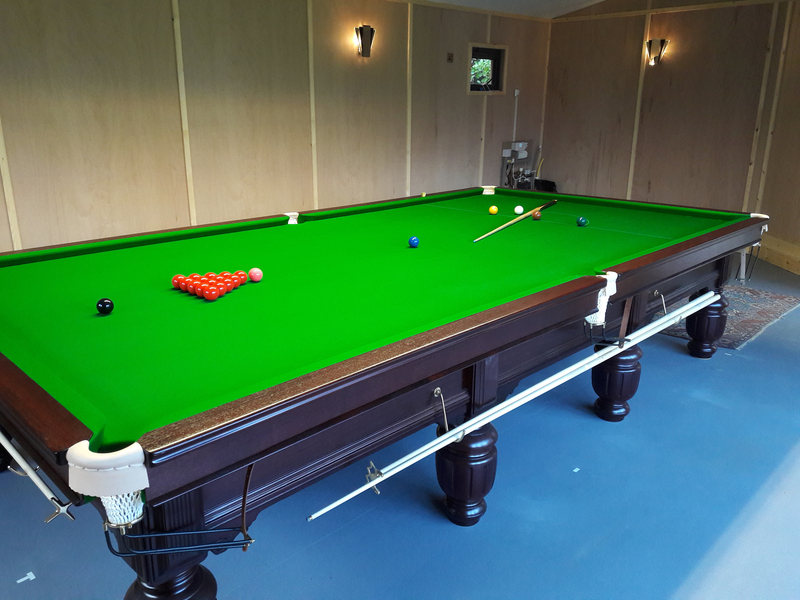 Hi Ian, Just a quick note to say thank you for snooker table that was installed last week. It looks absolutely fantastic and as good as new. The installation was hassle free and the guys did a great job. It has been great doing business with you. We have had the table now for a few weeks and just wanted to drop a note to say how much the whole family are enjoying the table. The workmanship is first class and the table plays like a dream. Installation was also seamless and on time. Ian - Just wanted to say a massive thanks. It is absolutly fantastic. Great suggestion for the lights. Just wanted to say thank you very much for your excellent service. We are really pleased with the pool table and it looks really good. The fitters were very friendly and helpful. Just a couple of photos to be going on with - table is fantastic and for 100 years old it is in amazing condition - it almost looks too new. The room still has to be decorated, windows cleaned etc and needs a few tweaks so it looks rather scruffy on the photos. I will try and send some in the future when the room is complete with some furniture. Regarding the fitting service, Graeme and Stuart were brilliant, particularly considering their 5-30 morning start and a 2-1/2 hour journey. All completed in 4 hours and it was a pleasure chatting with them as I handed over the occasional coffee. I was amazed how quickly and accurately the levelling process was and Stuart explained the process as he progressed - fascinating. Many thanks to you and your colleagues for an excellent service from start to finish. Hi Ian. What a great pair of guys Graeme and Stuart are, top men. Thanks for all your guidance through the whole process, and what a fantastic table, beautifully restored and spot on. I’ve sent some dodgy photos, no electric yet in the room!!! I will send some better ones when the room is finished. Superb service from you all. Cheers and Happy Xmas From a happy bunny Deryk. Good morning Ian, thank you for the table it’s perfect, not slept since it’s been fitted. A big thank you also to your fitters excellent pride and detail in their work, can 100% recommend your company to any and everyone. Hello Ian, Our table that you refurbished is back with us and to say we are delighted is an understatement. The workmanship is of the highest standard and the table looks great. I have played my first game on it and I look forward to hours of enjoyment from it in the future. Many thanks to the lads again, it was pleasure to deal with them. 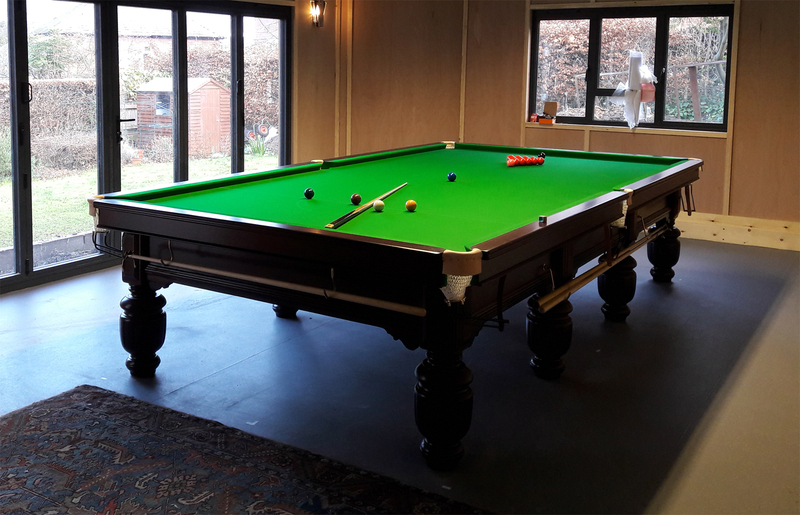 I was very pleased with the way Ian and his team of fitters, who done an excellent job of fitting our 10ft Burroughes and Watts snooker table. The guys said they would arrive at 8.30 am and on the minute they arrived! Nice guys, very helpful and above all else excellent workman ship in installing what is a second hand table, even though it looked brand new. I cannot recommend Ian Donohoe enough, great team and excellent sales, after sales. A very happy customer..
Hi Ian, Beautiful, extraordinary, sublime !!! I want to tell everyone, and you can believe me, that you can trust Ian Donohoe completely. Contact, advice, manufacturing, everything is perfect. I invite anyone to come and see this wonder if you go to the east of France ! Thank you Ian for this achievement. Thank you to everyone who participated. Ian, Really pleased with the table. Great quality and plays great. Many thanks to all involved. Thanks for the successful delivery of the table. The fitters did a great job and the workmanship on the table is outstanding. Just wanted to pass on our sincere thanks for the fantastic table. The fitters did a superb job putting it up as they were friendly, efficient and knowledgeable about their craft. They gave me some great tips in looking after the cloth and made sure the table played completely true before leaving. It looks amazing and the table itself is of such quality and looks majestic. I just wanted to say a massive thankyou to you and everyone that has been involved in providing the snooker table. I cannot believe how good it looks and I am absolutely delighted with it. Throughout the whole process from our first discussion to completing the installation today it has been a pleasure to deal with you and everyone else involved. I cannot thank you enough for providing me with such a beautiful item and your service is a credit to you. I would highly recommend you to anyone who needs anything to do with snooker. Hi Ian, Thanks so much. We are absolutely delighted!!! If you ever need a recommendation for excellent product and service, please let me know. Your installation guys were brilliant. Thanks again and have a great Christmas. Guys installed the table today and were fantastic. Really pleased. Only had time for a couple of frames so far but it’s playing well. Thanks very much for your patience and service. If you’re ever down this way and fancy a frame, give me a call. I wanted to send a note to say the table was received this past Friday. The very sturdy crate arrived in good shape and when I opened it the packing was first class. I was able to set it up on Saturday morning and have been enjoying it ever since. I have attached some pictures of it in its new home! Thank you again. If you are reading this review I can say Ian was incredible to deal with. I live in Canada and had wanted a 7' pool diner for many years. quick to respond to my many questions. I ended up with a custom table with stain and cloth match to my exact request. I just want to take some time this evening to email you regarding the snooker table which was installed at my home on Tuesday. The table is, as far as I am concerned, fantastic. 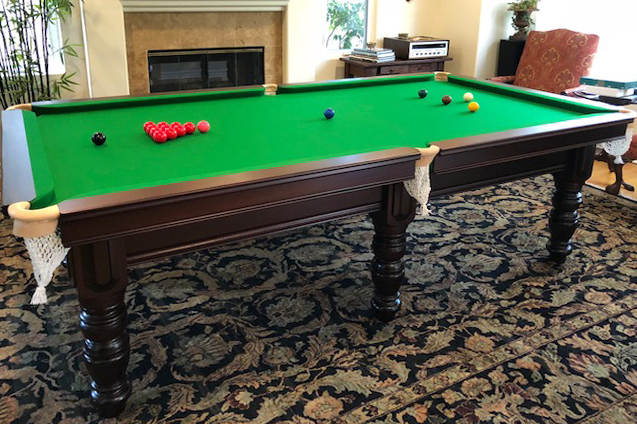 It is a beautifully restored quality piece of furniture and is certainly the best looking and best performing table I have ever played on. The two men who you arranged to deliver and install the table were brilliant too and sing your praises as someone who "restores faith in humanity". I am not quite sure what your motives are for providing such good value tables, perhaps you will share your reasons? Either way the table far surpasses my expectations, which is a surprise as I am regularly described as fussy. Whatever that means. With this amazing table I get to have a thing of beauty in my house. Happy days. Thanks again for all you have done start to finish. Just to say that my table has been received and installed. Your fitters were lovely people and did a cracking job. They actually arrived 45 minutes before the due time of 8:30am! The table looks fantastic – thanks so much. 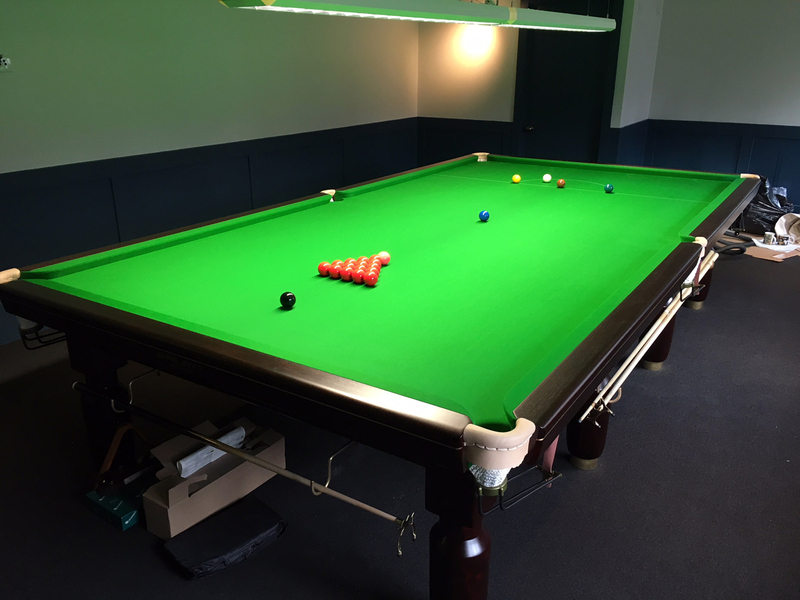 Many thanks for our Burroughs & Watts snooker table, its truly superb. The colour of the wood is also perfect, just what we wanted. The Fitters were also top class, couldn't ask for more. I just couldn't wait to let you know how delighted we are with the snooker table! It is amazing, in perfect condition, and looks stunning! I am totally over whelmed and cannot thank you enough! The fitters were also great guys and did an amazing job, even hoovering up when they were done! Thank you again! Many Thanks From a very happy family!!! 5 x fullsize Riley Pine Regis snooker tables to the Nugget Snooker Klub, Zagreb. Croatia. Hi Ian, Everthing perfect, I am so happy. Pictures here..
5 Pine Regis Snooker Tables refurbished, with two of our fitters fliying out to Zagreb to assemble and install. 7ft E.J Riley Cabriole Snooker Dining Table. Hereford. Hi Ian, Sorry for the delay, just wanted to say a quick thanks to you & the guys at Sovereign for the table I recently purchased from you. Really pleased with it & it looks great in my newly decorated dining room. I feel justified in my decision to buy a refurbished 'antique' table over the similarly priced modern day equivalents as I very much doubt the quality of them would be anywhere close to the Riley table you supplied to us. Thanks again. 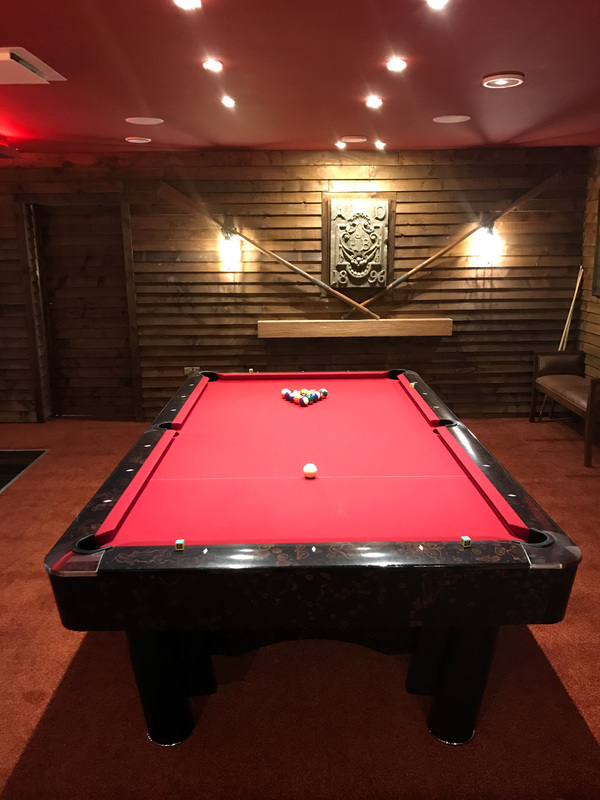 9ft Sam K Steel American Pool Table. Altrincham. The table is great, exactly as I pictured it. The chaps who brought it were great too. Hopefully this picture gives you an idea of how it looks in my bar. 8ft E.J Riley Snooker Table. Nottingham. Hi Ian I would like to say a big thankyou your table is excellent and your fitters were brilliant, I'm very happy. 9ft Sam K Steel American Pool Table. Swindon. Hi Ian, Sorry for the slowness of the note, I've obviously been playing all day :-). I just wanted to let you know that I'm over the moon with the new table. All in all, I don't see how the experience could have been any better. You have been amazing to deal with and the fitters (Stuart and Graeme) were absolutely top class. Sadly it's becoming increasingly rare these days, but I can honestly say that both yourself and your fitters have exceeded my expectations in absolutely every possible area. Should I come across anyone looking for a pool or snooker table I would without question send them to you. Thanks so much for a wonderful purchasing experience. 6ft E.J Riley Snooker Dining Table. Liverpool. Just wanted to say thank you - we have already enjoyed some games of snooker and pool. We also wanted to thank your fitters who were courteous, helpful, and knowledgeable. 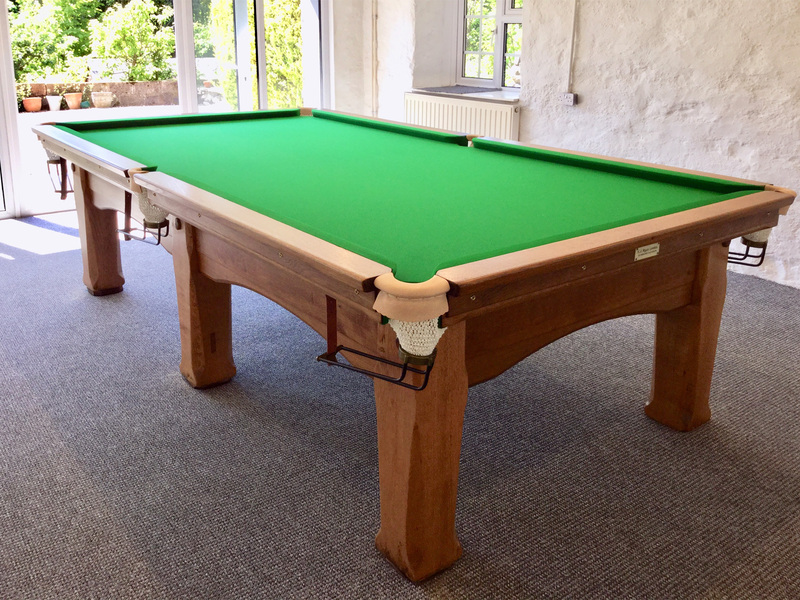 12ft Riley Pine Regis Snooker Table. Leeds. I just wanted to say how pleased we are with the quality of the snooker table. The fitters were superb - friendly and very helpful with tips for maintaining the table from this point on. All in all, we couldn't be more pleased. Thank you so much. I have to say I’m absolutely delighted with it, the quality is really fabulous and it’s just what I was after. The whole family is looking forward to many years of pleasure playing on it. The installers were also consummate professionals and great to deal with. Just a quickie to say how delighted we are with the pool table. Graham and Stuart did a fantastic job ,taking the time to ensure it was in the right spot. Absolutely fantastic table, rapid professional installation service. Just a message to thank you for a superb snooker table you installed. The table is refurbished to a very high standard and took 5 hrs to install to perfection well worth the £1750. 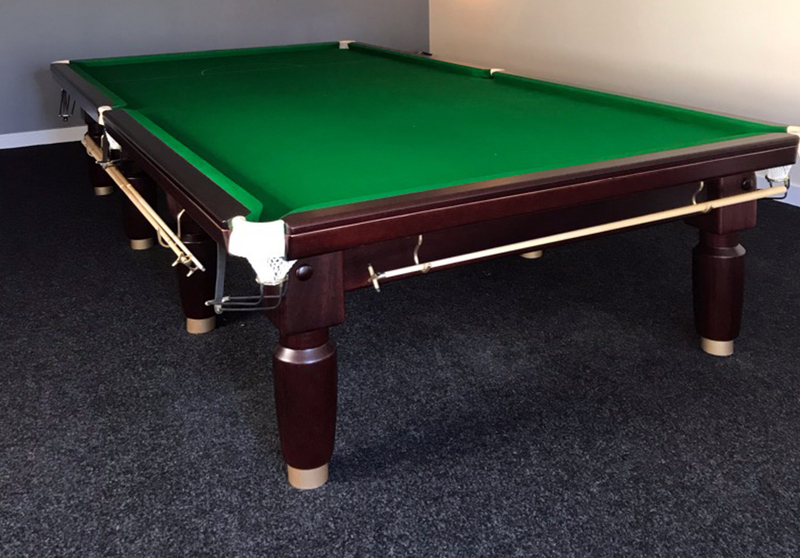 Just looks like a brand new table and I would highly recommend these guys to fit you a snooker table thanks from a satisfied customer. Andy Sharples from Bolton Road Darwen. Really pleased with it. It's what we expected and we were not disappointed. 8ft E.J Riley mahogany, four piece slate. Just a note to say how pleased we are with the snooker table. Many thanks Jon. Top quality pool dining table. Brilliant service, table delivered in 6 days! Hi Ian, table arrived today, the fitters turned up bang on time. I just want to say the table is more than I could have hoped for, its just like a new one. Both the fitters worked hard and their workmanship is second to none. true craftsman and a pleasure to speak to. I have recommend you to a friend of mine who hopes to follow in my footsteps and convert an out building next year to a snooker room , he has yet to see mine but I know that he will be very impressed when he does . Many Thanks to you and the fitters. Hi Ian Just writing to say how delighted I am with the snooker table. It's true, the finish is as new and the quality of service and product has surpassed all of my expectations. Thank you for everything and pass my appreciations to Mario as well. Yes you are very welcome to use my comments on your testimonials page. Should any prospective customer want a reference then feel free to give them my email address. Thanks again. Best wishes. The snooker table is great we have already had a few games on it. I would like to say how helpful the guys were when they came to fit it nothing was to much for them , I am really pleased with everything they did. Thanks again for all your help. Hi Ian, thanks for swift reliable first class service all round, and two lads were gentlemen too. They did great job and the table is amazing!! Thanks again. 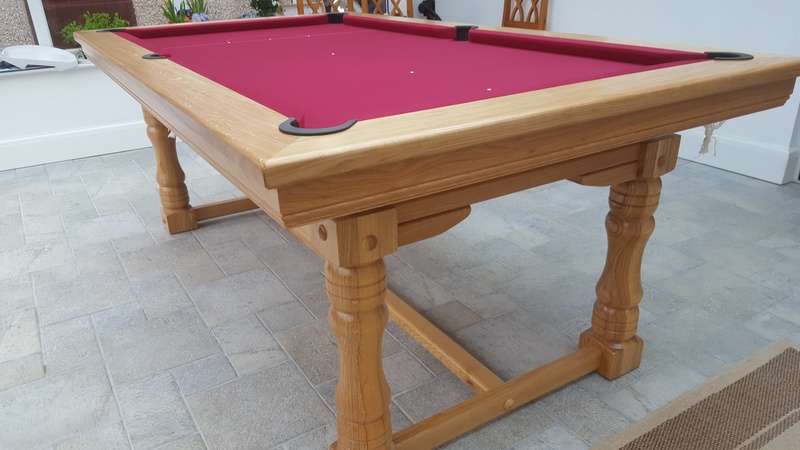 Item was very fairly priced, essentially accurately described and delivered OK.
Hi Ian, just to drop you a line to say how impressed I am with the snooker table its awesome. 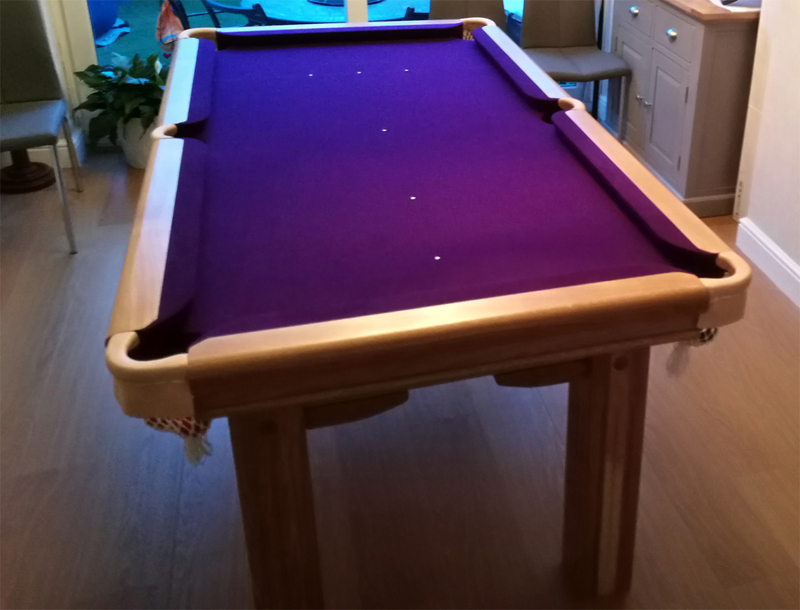 The fitter was so professional and had it all assembled in no time, I look forward to enjoying many hours playing snooker with all my family and friends. thanks again for your great product and service. 3 Full size Riley Aristocrats to the Swiss Snooker association. Dear Graeme, Ian and everybody else involved with our tables!!! Just thought I'd drop you a note to say thanks. The installation chaps finished earlier and the table is absolutely beautiful, massively exceeding my expectations (which we're already high! ), the finish is absolutely beautiful and the table as a whole is just magnificent. I thought from your web site that I'd be dealing with true craftsman and that's exactly the experience I've had. Thanks. “From initial contact through to delivery and installation I was thoroughly impressed with their standard of service and workmanship. Any questions I had were answered quickly and the whole process went smoothly. The table is fantastic, a wonderful piece of classic English furniture! It's in great condition, they guys set it up in good time and I am so proud I bought a "real" table instead of the cheaper Asian lookalike ones. Thank you very much for a great product and excellent fitting service. If you ever need a reference for future sales then people are welcome to call me. Just as you promised, the scoreboard arrived this morning and I am more than happy with it. 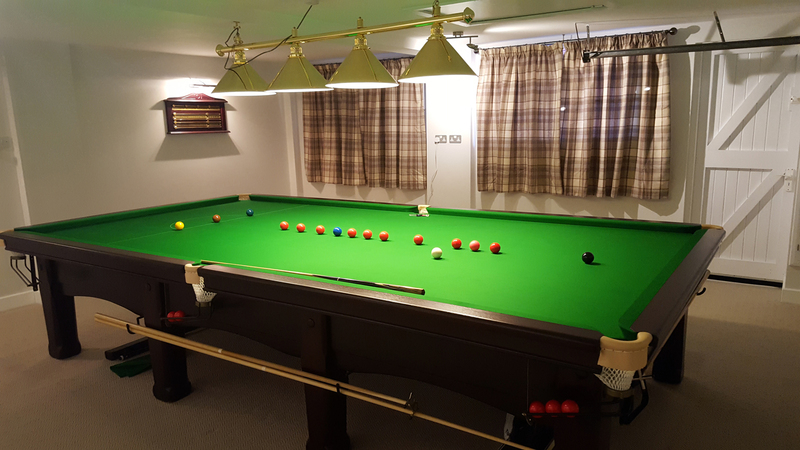 Thanks again for all your help and for the snooker table and chairs - an excellent product at an excellent price. Just thought I would let you know that the table looks great. Delivery and installation was an excellent job. I just thought I would take this opportunity to thank you. very quick and excellent installation service- table is fantastic. This is one of the few Restorers left in this country that has such a wealth of real skilled labour and delivers such fine craftsmanship and quality of service. Snooker & Pool Tables in the Industry. Right here in Accrington Lancashire England. Refurbished secondhand and antique tables.